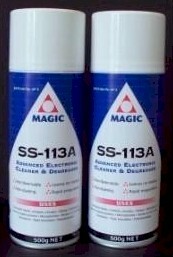 The special solvent system used in SS-113A utilises the fluorocarbon range of chemicals and has been specially formulated to give selective solvency action for the removal of contaminate material such as oil, grease, solder flux residues and atmospheric dust or dirt from sensitive equipment. SS-113A is ideal for use on electrical contacts, circuitry, relays, distributors, alarms and signal systems. Non-staining, completely volatile, leaves no residue and evaporates quickly. Exhibits high density and low surface tension properties which add to its efficiency as an effective cleaning agent. Can be used in vapour and ultrasonic degreasing units without the aid of high temperature processing facilities which are necessary with chlorinated solvents. Suitable for cleaning contacts of sensitive circuitry systems associated with electronic radio, television recorders or similar equipment. 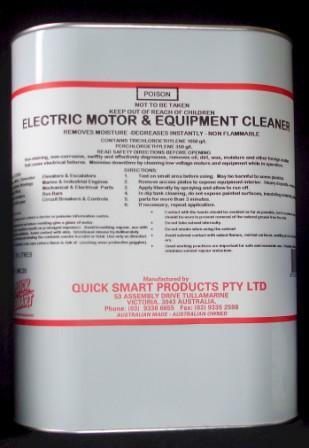 A unique, scientifically formulated cleaner and degreaser that effectively removes moisture, grease, oil, wax, dirt and other contaminants from motors, parts and other electrical/mechanical equipment. No flash point. No fire point. 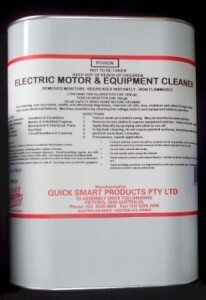 Use to clean electric motors, high voltage switch gear, alarms, air conditioners, bush bars, cables, gear boxes, pumps, generators, welders, compressors, transformers, fork lift trucks, surfaces prior to anti-corrosion coatings.